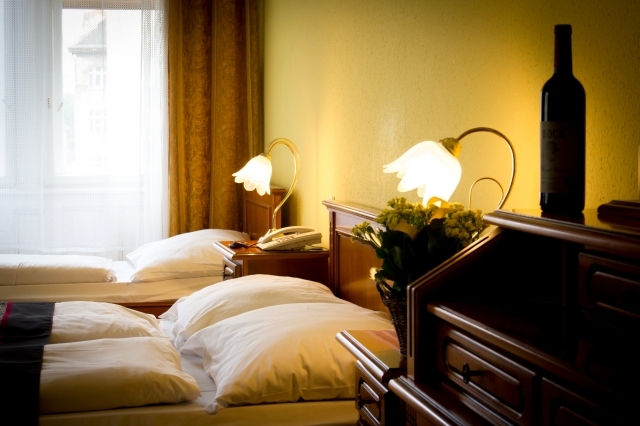 Hotel Unio*** can be found commercial and business district of Budapest city. 10-20 minutes from the hotel with a comfortable walk available the Opera house, Liszt Ferenc Musicacademy, the Heros''s square, the House of Terror, the Museum of Fine Arts and many wonderful buildings and sights. It is not necessary to get in a car, if man would like to have some leisure facilities, because many drawn theatres and a club desire can be found near to the hotel. Our 50 rooms furnished with classical furnitures reminds for the 20th century, but the 21st century''s technical equipments make our guests'' comfort pleasanter. With telephone, adjustable air conditioning, which are disposal of our rooms, supplied with minibar, colour television and safe. The house''s inner world unites the conditions in perfect harmony, if man needs, let it be the oasis of the restful clocks of life or human creating thoughts need incentive environment for his creation. Our 24 hours reception service orders help to our guests'' disposal with the wide choice of programs, and helps to find all the beauties of Budapest. In our hotel is available FREE WI-Fi. City Hotel Unio awaits its guests with 52 comfortable rooms with equipment and furniture exceeding the level of three-star hotels. Every room has individually controlled air conditioning, bathroom, telephone, TV, minibar, hairdryer and safe. We have: single room, double/twin room, triple room and quadruple room. WI-FI is available FREE of charge! City Hotel Unio's family style restaurant offers Hungarian and international cuisine. The restaurant can seat 75 persons. The elegant restaurant serves buffet breakfast for the hotel guests and buffet lunch and dinner with a wide variety of dishes are available not only for hotel guests but also for the public (soups, main dishes, garnishes, salads, cold and warm desserts, beer, wine, fruit juices, mineral water). The three air-conditioned conference rooms of City Hotel Unio are perfect venues for seminars, trainings, business meetings, product demonstrations, exhibitions, luncheons, family events, weddings, receptions and conferences. From the South (Déli pu.) and East (Keleti pu.) railway stations take metro line 2 to Blaha Lujza tér. From the West railway station (metro no.3, tram no.4 and 6) with tram till Király street (2nd station), afterwards turn in to Dob street from Király street (first street to the left).